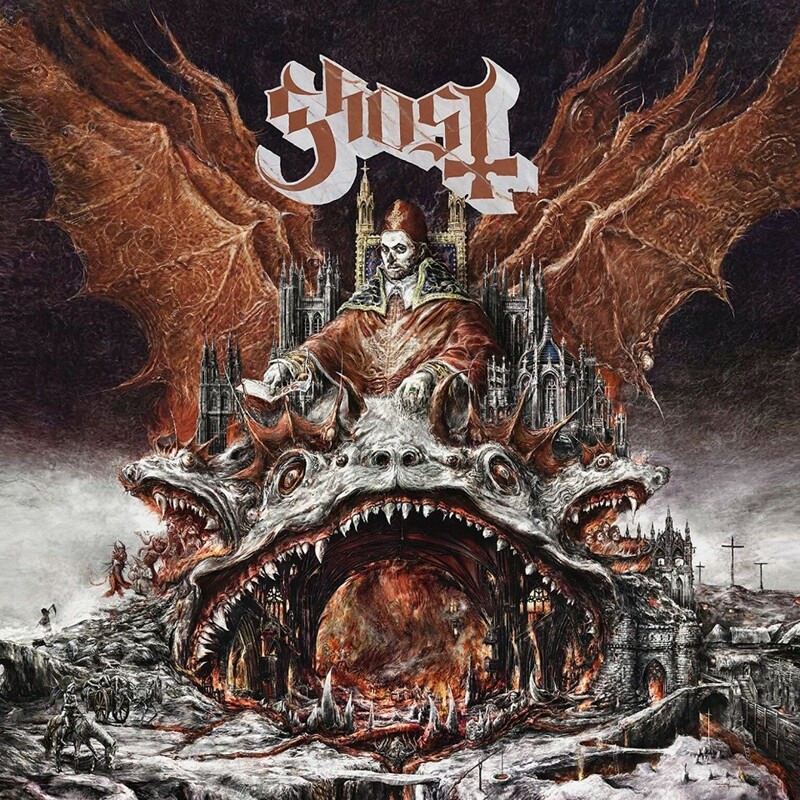 ​When Papa has gone, pop has come: Opinion about Ghost’s new album "Prequelle"
Released on June 1 via Loma Vista, Ghost’s 4th LP "Prequelle", announced as more "darker" album than "Meliora", in fact, proved to be an obvious flirtation with the mass consumer, becoming the most commercially successful record of the band in their entire career. Only in the first week, more than 60,000 copies were sold. There won’t be many details about the band’s biography, but it should be pretty clear that such commercial success is certainly preceded by years of hard work. For Ghost’s members (especially its permanent leader Tobias Forge), formed in 2006 in the small Swedish town of Linköping (with a population of 100 thousand people), it was a long way, accompanied by the quitting of the job for the sake of the musical career, the creation of its own style with recognizable image, numerous tours, the release of a few records, the first Grammy award (perhaps, because of the new Ghost course towards more 'lighter' music — that was not their last award in the category "Best Metal Performance", haha), reaping the fruits of major success and, along with it, legal proceedings between the band’s musicians because of money, with the unveiling of their real names. In 2018, "changing" once again its frontman during the active promotional campaign of the album "Prequelle", Ghost presented to the public a new leader named Cardinal Copia, who ended, so to speak, the Emeritus dynasty with its 3 Papas vocalists. Together with the last Papa’s passing, with whom the band has released clearly intended for a mass market single "Square Hammer", the band made their sound more 'lighter', revealing their new offering early this summer. See also: Ghost, "It's a constant improvement that we're trying to achieve"
"Bands like Ghost seem to confirm the belief that a real artist should stay starving. It's not for nothing that they say that fame and fortune is the biggest test for a musician, someone passes it like The Beatles, Queen or Rolling Stones, turning into a cult group, and someone with a crash fails it, as members of Kiss and Guns N' Roses, becoming a talk of the town. Ghost also experienced a baptism by fire and scandals over money with subsequent court proceedings were only one of the negative manifestations of fame and commercial success, because the most important thing is that suffers here in the first place is music. Probably not many of today's active fans of Ghost, who react negatively to any even objective criticism of the band, can call "Opus Eponymous" their favorite album, but in my opinion this is the best release of the group In terms of music, lyrics, atmosphere and sound with a clear tinge of the old school, this LP shows Ghost in all its glory — at the moment of its release it was like a breath of fresh air, a combination of clean tenor, heavy music, satanic lyrics, vintage sound with an organ using, as well as the image of the Papa surrounded by Nameless Ghouls left an indelible impression. Importantly, the album itself is incredibly good — you don’t have to replay the frontman's dance patterns, like in the case of "Prequelle", and think, "Oh, well, that's probably the reference to "Thriller" and "Cats" musical, and this song with the simplest chorus in the style of "I Was Made For Lovin' You" made Phil Anselmo smile", and so on. "Infestissumam" was also a good release, where even the intro itself turned out to be incredibly catchy and memorable, not to mention such hits as "Secular Haze", "Year Zero" or "Monstrance Clock". The 3rd album, "Meliora", has gradually started to losing ground in musical terms, which in turn, on the contrary, brought the group more audience and recognition from critics, in particular, the victory on the "musical Oscar" Grammy with the song "Cirice". Listen to this release in full was already trivial uninteresting, it was quite boring and wasn't able to grab your attention as the previous ones. The latest album, because of such pretty simple songs as "Dance Macabre" (which can somehow force to nod to the beat due to its rhythm, but literally the word ends up with its annoying repeating chorus) and lyrical "See the Light", "Pro Memoria", "Life Eternal" (the last one, no one particularly bothered with the rhyme, deciding to end most of the song lines with the word "forever"), which don’t help me at all to find any reason or desire to listen to this record again. "Rats" and a couple of instrumental tracks — the only thing that almost causes positive emotions about this release. But such a frank pop approach to songs writing with an accent on vocal parts (sorry, but Forge is not Demis Roussos and can't handle lyric songs by himself), a polished sound and poor choruses with looped refrains, to my regret, doesn’t make "Prequelle" musical worthwhile piece, despite the numerous positive reviews of our colleagues and shopworn "news" like "Wow, Rihanna imitates Ghost's outfit!? ", and, probably, a new Grammy looming on the horizon. Today, when Immortal and Wolves in the Throne Room, regularly appearing on magazines’ covers, receive awards from Metal Hammer in the category "Best Underground", is it any wonder that Ghost’s lightest pop-rock album "Prequelle", followed by a well-funded promo campaign, receives so many positive reviews?" "Rarely I undertake to evaluate this or that album only just after the second listening. To form an opinion, having weighed all the pros and cons, the disc should be played at least 3 or 4 times, ideally with something that sounds in the background in between. If it concerns the expected record of a group that is interesting not only for the next review, the evaluation period can increase for a week or more. During this time, I get rid of the euphoria caused by the expectation, form the first impression and run the record a few more times, in order to convince myself of the opposite (‘cause maybe I'm wrong about it). Often, the already revised first opinion is the most honest and unbiased. With "Prequelle", it was a little bit different. For me, the last, really expected release of Ghost (the masters who has been following the principle "all ingenious is simple" since their debut record "Opus Eponymous") was their 3rd LP "Meliora". The disk pretty soon made it clear what the band was heading to, no matter how unfortunate it was. And the confirmation of the new course "where plebs lap it up" was the album's high ratings with its actual slackness, like a hastily composed tracklist that didn’t produce the effect that its predecessors, the pop songs "He Is", "Majesty" and the clearly over-emphasized "Cirice", well, and then completely faded EP "Popestar". However, despite even my idle curiosity, I continued to listen to "Prequelle" for several days in the hope of catching on to something hidden, something two-valued. I tried to find an explanation for so monotonous tracklist, so "dry", stereotyped compositions and a completely stupid turn in development of such a promising project. What is true, later I admitted to myself: in fact, I just did not want to put up with Ghost's even stranger step from what already in the first years of their existence so distinguished them against the background of the general mass. Probably, such comment looks extremely pessimistic. Someone will say, "Why did you ganging up on this band, guys? ", and the other one will wave high review scores from major zines in front of our faces. But the fact remains: on "Prequelle", there are only a few worth things: the intro "Ashes", the song "Rats", produced in Ghost’s already new "disco" style, and not so bad "Faith". And that’s all. What else? A labored "See The Light" with such a vocal part in the chorus, as if it was performed by Justin Bieber, dressed in another shirt with a metal band logo? A disco "Dance Macabre"? Or, maybe, incredibly vapid and boring "Pro Memoria" or "Witch Image"? Don't make me laugh! A few years ago, these devils could drive Vatican City up the wall, and now more than half of "Prequelle" tracklist can fully enter the Sunday Mass program of some dancing house of Christ. Again, it’s not possible to get rid of the feeling that the album was collected from previously stuck ideas which were discarded in favor of such works as "Ritual", "Year Zero", "Satan Prayer", "Secular Haze" and even the same-named intro of the second LP "Infestissumam". Is it worth considering the record as a kind of one-time "prequel" to everything that Ghost have produced earlier? I don’t know. But I would like to believe in this and hope that one day the band will return with some kind of "sequel" of its best stuff."